Ahead of the public launch of iOS 10 coming tomorrow, Apple today made the Messages App Store live, aggregating all of the apps, games, and sticker packs that can be used in the Messages app and making them available for download. The Messages App Store looks almost identical to the iOS App Store, so the interface will be immediately familiar to iOS 10 users. 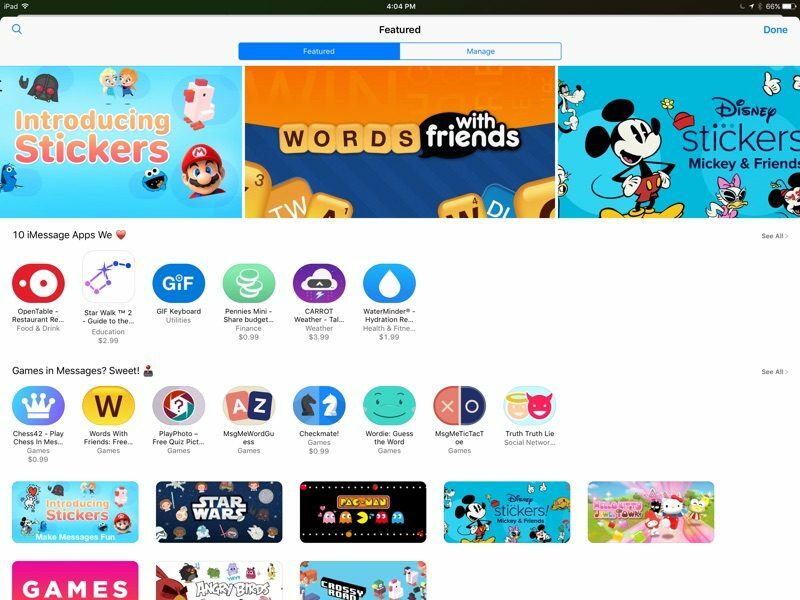 There are featured apps and stickers displayed at the top of the store, along with editorial picks like "10 iMessage Apps We Love" and "Games in Messages? Sweet!" Apps for the Messages App Store are already available, including titles like Games With Friends, Tic Tac Toe, Star Walk, Carrot Weather, Yelp, IMDB, OpenTable, Zen Brush 2, and more. A number of sticker packs are also available from well-known app developers, including Pac-Man, Star Wars, Angry Birds, Hello Kitty, Crossy Road, and more. iOS 10 sticker packs and apps started rolling out earlier today. The Messages App Store is a little bit sparse right now because apps are still being released, but when iOS 10 becomes available tomorrow, there will be dozens if not hundreds of apps and sticker packs ready to download. iOS 10 is expected to debut at 10:00 a.m. Pacific Time on Tuesday, September 13. I know I'm not speaking for everyone, but who on earth actually uses iMessage anymore? Almost everybody! In my experience. I use Messages all the time. Most of my friends do as well. I have to admit, never thought there would ever be a message App Store. I'd say over 95% of the texts I get each day are via iMessage, but that's just me as a single data point.
" 'Apple's iMessage handles an absurd amount of messages: sometimes as many as 200,000 per second, according to Apple services boss Eddy Cue...' And: In 2014, CEO Tim Cook said that Apple handles 40 billion iMessage notifications per day ('https://www.macrumors.com/2014/02/28/apple-40-billion-imessages/')." Yep, Apple's Messages app is my primary form of not-in-person communication with a lot of people. It handles groups, typing indicators, and read receipts well, it's encrypted, and falls back gracefully to text messages for those who don't have iOS. And it works seamlessly across my phone, watch, iPad, and tablet, even using the phone to proxy text messages through to my laptop. It makes me quite happy. What's not to like? App Store button not working yet in iOS 10. Could be a Canada issue. I use it all the time, between family members, co-workers and friends.